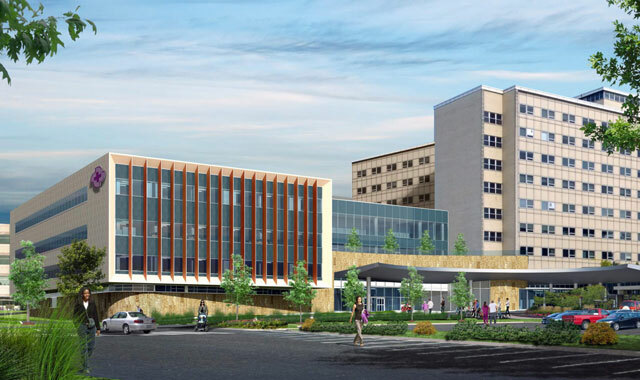 Several projects are underway at our region’s hospitals, with large investments fueling new buildings and renovations at OSF Saint Anthony Medical Center, SwedishAmerican Hospital, Mercyhealth hospitals and Beloit Memorial Hospital. Check in with the CEOs of these medical centers to find out how these projects bolster our regional economy and health care options. SwedishAmerican reveals its plans to invest $130 million to construct a new women’s and children’s tower and make additional renovations to its Midtown Rockford campus. When it comes to health care, modernization is key. For many reasons, keeping hospital facilities updated is a major benefit to the community and represents a competitive edge in the health care market. We’re lucky to live in a region where our hospitals prioritize modernization through continuous investments. OSF Saint Anthony Medical Center and SwedishAmerican Hospital are undergoing renovations that will add more private rooms. Mercyhealth is building a new hospital campus in the northeast corner of Rockford and investing in its west-side hospital. And, just across the state line, Beloit Memorial Hospital recently opened the new Hendricks Family Heart Hospital. Looking at these new projects, one thing is certain: you don’t need to leave the region to find quality health care. 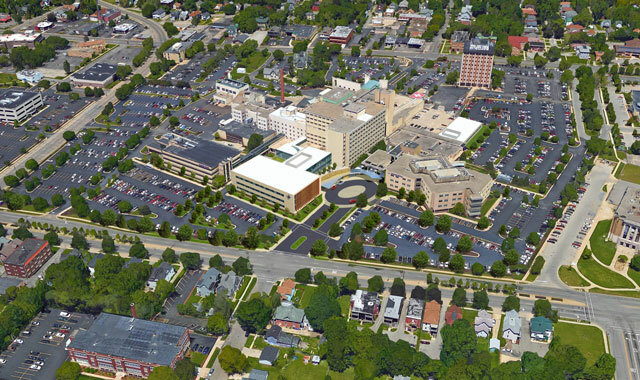 This aerial view rendering of SwedishAmerican Hospital shows what the East State Street campus will look like in about 4.5 years, after anticipated renovations are complete. Earlier this year, SwedishAmerican announced a plan to invest $130 million to construct a new women’s and children’s tower and make significant additional renovations to its Midtown Rockford campus. Since 2001, SwedishAmerican has invested more than $630 million in its campus. To keep its facilities modernized, SwedishAmerican is renovating its main facility to have all private rooms – a feature Born says will lead to an enhanced patient and family experience, as well as increased patient safety. Other renovations include an expanded emergency department, an additional 10 pediatric/adolescent psychiatric beds, and additions to the surgery and catheterization lab areas of the hospital. With these renovations comes an additional four-story building to serve women and children on the main campus. Features of this building include expanded pediatric subspecialty services and a Level III neonatal intensive care unit (NICU) – the highest-rated level of care for newborns. The renovation plan also includes inpatient pediatric behavioral health beds, a service that hasn’t been available in northern Illinois for the past 15 years. Born says SwedishAmerican has many behavioral health patients who show up in the emergency department, where they’re stabilized and either admitted or discharged with a follow-up plan. An increase in behavioral health patients suggests there’s a need for expanded inpatient care for behavioral health, especially in the pediatric/adolescent age group. Born estimates the new building will be completed in about two years, while the hospital renovations will be completed in about four to 4.5 years. Throughout these years of construction, normal health care operations must be maintained. That’s why expanding an existing campus involves a highly skilled project management team. Born estimates these projects will create about 600 union labor jobs during the construction phase and an increased amount of permanent clinical jobs once the projects are complete. Renovation designs will also take telemedicine into account, or the use of technology to provide health care from a distance. Remote access is especially relevant since SwedishAmerican became a division of UW Health on Jan. 1, 2015. Since the completion of this merger, SwedishAmerican’s physician group has grown. Last year, 67 UW physicians traveled to Rockford to serve patients. This year, about 85 UW physicians are serving the Rockford area. Earlier this year, SwedishAmerican also partnered with Aunt Martha’s Health & Wellness, a system of clinics that provides care and prevention services for children, teens and families. Aunt Martha’s opened its on-site health center at SwedishAmerican on Aug. 1. The clinic currently offers integrated mental health services, primary care services and women’s health services. SwedishAmerican plans to appear before the Illinois Health Facilities and Services Review Board in January, as it seeks regulators’ approval for the new women’s and children’s tower, as well as additional campus renovations. OSF Saint Anthony Medical Center is investing $85 million to expand its current facility. The campus is also configuring many semi-private rooms into private rooms. Construction is currently in progress. When OSF HealthCare Saint Anthony Medical Center was constructed in the 1960s, it was predominantly built with semi-private rooms. Today, the hospital is modernizing its campus by configuring many of these spaces into completely private rooms. The private rooms have three main zones: a caregiver zone, a patient zone and a family zone. This configuration allows family members to spend the night, if they choose, on a pullout bed. These accommodations currently aren’t offered in semi-private rooms. It was important to Carynski to get patient feedback when designing these private rooms. In January, a mock patient room was built to serve as a prototype for what a private room would look like. OSF Saint Anthony is also investing $85 million to expand its current facility. In 2018, the hospital will open a new 144,247 square-foot, four-story pavilion. This North Tower will have three floors of private rooms and one floor of amenities, including a rejuvenated women’s health center, a kitchen demonstration area, expanded pharmacy services and PromptCare. There will be 78 private rooms in the North Tower and a total of 190 private rooms across the entire campus. The entire first floor of the new pavilion is dedicated toward new amenities. The kitchen area will host live demonstrations on how to cook healthy meals. Expanded pharmacy services include a new med-to-bed program, allowing patients to get their prescriptions filled before they leave the hospital. And finally, a new PromptCare will help assist patients who don’t have acute emergencies. OSF Saint Anthony is on time and on budget for completing these projects. Bishop David John Malloy will bless the new facility on April 13, and operations in the new facility will begin the following day. During the construction phase, OSF Saint Anthony added about 700 union labor jobs. Over the past two years, the medical center has invested more than $120 million in various projects – $85 million in the new pavilion, $7 million toward enhancing the cancer center, $3 million toward an interventional room for stroke victims, and $6 million toward a primary care clinic on Parkview Avenue. The rest has gone toward infrastructure maintenance. 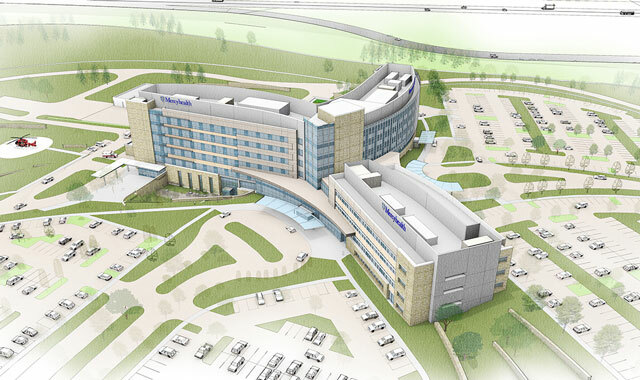 Mercyhealth is constructing a new $505 million hospital and medical center campus on I-90 and Riverside Boulevard. The project is on track for completion in late 2018. Mercyhealth also plans to invest $50 million in its Rockton Avenue campus over the next 10 years. Construction is moving along for Mercyhealth’s new $505 million hospital and medical center campus on I-90 and Riverside Boulevard. Mercyhealth plans to have two full-service hospitals in Rockford, in addition to 14 clinics and medical centers in Boone, Ogle and Winnebago counties – several of which are either new or have recently been expanded and renovated. The new hospital will provide emergency services to the community, as well as a convenient walk-in clinic. Mercyhealth will also continue to invest $50 million in the Rockton Avenue campus over the next 10 years. The new hospital is one of the largest construction projects in the history of Rockford. 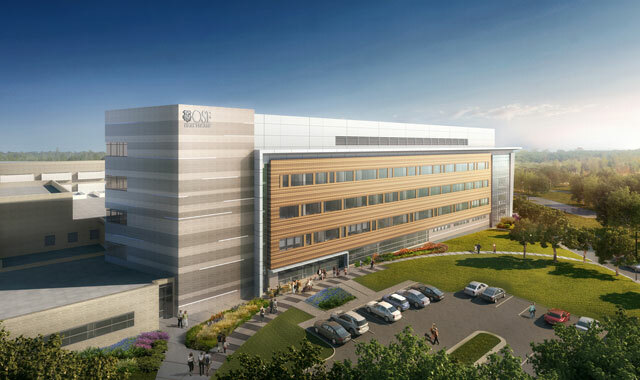 The campus will have 194 private inpatient rooms and extensive specialty services, including a level III NICU – the highest level of neonatal care – pediatric intensive care, high-risk perinatal care, adult inpatient care and intensive care, a level I trauma center – the highest level of emergency care, plus state-of-the-art operating suites and surgical services to support a full range of inpatient and outpatient surgery. The Rockton Avenue campus will continue to grow, as well. Many services have been enhanced at the Rockton Avenue campus. There are several new adult and pediatric orthopedic surgeons who specialize in sports medicine, joint replacement, hand surgery and trauma surgery. Improvements have been made to a small baby unit, which offers a healing environment for babies weighing less than 2.2 pounds. The cancer center has a newly renovated infusion center, and the pre-hospital and emergency services center has a renovated 16,500 square-foot facility. Between its new hospital and Rockton Avenue campus, Mercyhealth has been a catalyst for new local jobs and economic growth. Outside of its hospital projects, Mercyhealth has also been serving patients through new community partnerships and collaborations. In early 2016, the health care system teamed up with Crusader Community Health, a community-based health care organization that serves people in need in the Rock River Valley area. Now, all pregnant women who seek care at Crusader have their babies at Mercyhealth Hospital-Rockton Avenue, Bea says. If needed, women also have access to the advanced maternal care at the regional perinatal center. Earlier this year, Mercyhealth partnered with Ann & Robert H. Lurie Children’s Hospital of Chicago, one of the top children’s hospitals in the country. In September 2016, Mercyhealth Cherry Valley opened. The more than $3.5 million facility offers family medicine, sports medicine, and lab and X-ray services. Mercyhealth opened the facility to better meet the needs of the residents of Cherry Valley and the southeast quadrant of Rockford, Bea says. In addition, Mercyhealth spent $8.5 million to renovate and expand Mercyhealth Roscoe. In addition to internal medicine, obstetrics and gynecology, pediatrics, urgent care, and lab and X-ray services, the location now offers physical therapy, podiatry, mammography, computed tomography (CT), magnetic resonance imaging (MRI) and ultrasound diagnostic services. Mercyhealth is building a new, 20,000 square-foot facility – Mercyhealth Alpine, at 7802 N. Alpine Road in Loves Park. The medical center will offer internal medicine, pediatrics, adult rheumatology, lab and X-ray services. It will also be home to a new family medicine residency program that will train primary care physicians, Bea says. In addition, Mercyhealth is building a new, 24,000 square-foot facility, Mercyhealth Mulford, at 5970 Churchview Drive in Rockford. The medical center will offer internal medicine, lab and X-ray services. It will also be home to a new internal medicine residency program that will train primary care physicians. Mercyhealth also spent $1.9 million to give Mercyhealth Perryville a much-needed facelift and to upgrade technology. 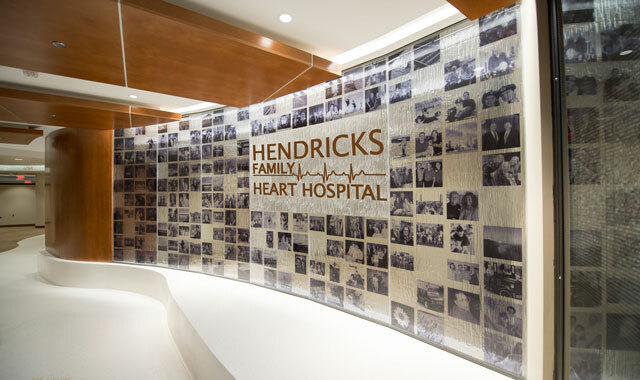 The completed Hendricks Family Heart Hospital encompasses the fourth floor of Beloit Memorial Hospital. The $13.8 million investment enhances regional cardiac services. Residents of our region don’t need to venture far to find quality heart health care. This past June, Beloit Memorial Hospital finished construction on the new 38,200 square-foot Hendricks Family Heart Hospital. The $13.8 million investment encompasses the entire fourth floor of Beloit Memorial Hospital and includes a hybrid operating room (OR), cardiac catheterization labs, a Cardiac Intensive Care Unit (ICU), and space for vascular service and cardiac rehabilitation. It also contains the Packard Family Cardiac Clinic, with 10 patient examination rooms and a stress lab. Upon entering the fourth floor, visitors are greeted by a beautiful sculpture depicting the importance of family, McKevett adds. Directly behind the sculpture is a glass photo wall featuring photos from the staff, patient families and physicians. The new operating room (OR) is more than double the size of a standard operating room, enabling physicians to convert from a minimally invasive procedure to an open-chest or open-heart surgery without having to change rooms, McKevett adds. The spacious vicinity also enables physicians to conduct advanced heart valve repair or replacement. In addition, the new OR facility expands Beloit Health System’s vascular program. Patients can now receive the benefits of advanced vascular surgery including endovascular, thoracic and abdominal aneurysm repair. The Heart Hospital’s intensive care unit (ICU) keeps all heart and complex interventional patients on the same floor and in close proximity to their physicians and specially trained nursing staff, McKevett says. An added bonus: patients in the ICU have private bathrooms and the opportunity to shower with the use of a shower chair, if possible. The Heart Hospital is staffed by cardiothoracic surgeons, interventional cardiologists, medical cardiologists, a vascular surgeon and more than 150 employees and support staff. The staff of health professionals includes cardiac surgeons Dr. Peter Marks and Dr. Hilton Hudson II; interventional cardiologists Dr. Leo Egbujiobi, Dr. Haroon Chughtai and Dr. Jorge Montilla; and cardiologists Dr. Phoebe Ezidinma and Dr. Maria Taveras. “Many of the heart and vascular services that patients had to travel out of town to receive can now be taken care of right here in Beloit,” McKevett says. 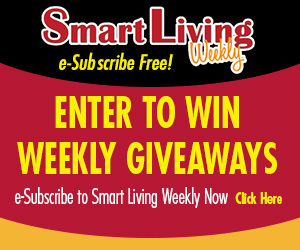 This entry was posted on Monday, October 9th, 2017 at 12:00 pm	and is filed under Northwest Business Magazine, Top Posts. You can follow any responses to this entry through the RSS 2.0 feed. Both comments and pings are currently closed.